Timmy Failure is a fabulously fun read and the line drawings are a treat. It's original and quirky, with real heart. Pastis, the creator of the comic strip Pearls Before Swine, brings a wonderfully droll and playful humor to a younger audience, balancing more straightforward gags with bits of irony and sarcasm. The wide-eyed figures that populate Pastis’ pen and ink illustrations have a delightfully peculiar, coiled energy...but there’s a nice emotional element to Timmy’s relationship with his struggling single mom, and readers will find a few moments of poignancy amidst all the laughs. Pastis ... peppers nearly every page of this comic romp with at least one intentionally amateurish black-and-white illustration, enhancing the laughs along the way as Timmy misses even the most obvious clues in Clouseauesque fashion. Middle grade readers will appreciate all the silly sleuthing and absurd details, and older readers–including parents who come along for the ride–will find a satisfying layer of more sophisticated humor, too. It is, without a doubt, the best of the cartoonist fare...completely and utterly understanding its genre, its pacing, and the importance of leveling humor with down-to-earth human problems...Top notch stuff. In his first foray into children's books, writer/cartoonist Stephan Pastis takes his befuddled character on a "rigorously fact-checked" series of misadventures that will delight kids and elicit more than a few chuckles from any adults lucky enough to read along. If this book doesn't make readers double over with laughter, then nothing will. Loaded with illustrations that are equally as hilarious as the story, this one is a guaranteed winner. With its high-low mix of humor and surprisingly sophisticated storytelling...“Failure” is anything but. 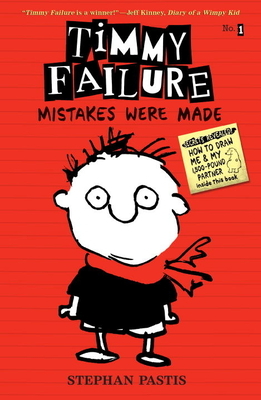 If 'Timmy Failure' was just a loose-knit story about an elementary school detective, it would still be hilarious. But Timmy's struggles and insecurities lend surprising depth. ... Laugh out loud funny. A great new hero.